At Primula, we create items by exploring how people prepare beverages in different cultures and work to understand the experience and ritual behind these preparations. Identifying why people love different and unique beverages is the first step in our creative process, our products are designed to exceed the expectations of our customers. 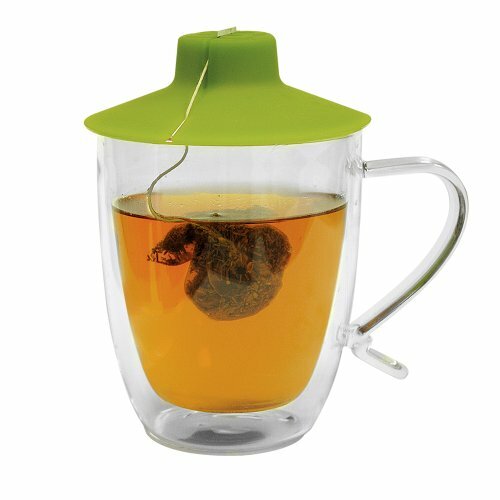 Primula’s Double Wall Glass Mug and Tea Bag Buddy are the tea lover’s solution to messy tea preparation and enjoying a hot cup of tea longer. The mug’s double wall design minimizes condensation and insulates for longer temperature retention. The multi-functional Tea Bag Buddy keeps heat in while brewing, assists in squeezing your teabag (no spoon required) and becomes a holder for your messy tea bag (ready for re-use). With this two piece set - now you can enjoy everything you love about tea even more. At Primula, something extraordinary is brewing. DOUBLE WALL MUG: Perfect for your favorite cup of tea or any other beverage, our double wall temperature safe borosilicate glass mug keeps its contents hot while remaining cool to the touch. It will keep cool and reduce condensation with cold beverages. Its clear aesthetic and double wall design creates an illusion of suspended beverages, exceptional for displaying artisan drinks or even desserts. TEA BAG BUDDY: The Primula Tea Bag Buddy was designed with the avid tea drinker in mind, and can suit a wide range of purposes: it acts as a lid to keep steam in while your tea brews, it allows you to steep your tea without the bag falling in, it lets you cleanly squeeze the remaining liquid in the tea bag back into your drink, and it holds your tea bag once you've removed it from the glass to eliminate unwanted drips. QUALITY SAFETY STANDARDS: Our Double Wall Glass Mug and Tea Bag Buddy are both made from quality materials. The Double Wall Glass Mug is made of temperature safe borosilicate glass and the Tea Bag Buddy consists of 100% BPA free food-grade silicone, making it as safe as it is useful. USE AND CARE: To use the tea buddy, slowly pour hot water into the glass mug. Secure the tea bag string in the Tea Bag Buddy and carefully place it onto the mug. Let the tea bag brew for 3-5 to minutes. Use the Tea Bag Buddy to squeeze extra water and flavor out of the tea bag. The Tea Bag Buddy can hold the used tea bag while you enjoy your freshly brewed beverage. Both the mug and Tea Bag Buddy are dishwasher and microwave safe. SPECIFICATIONS: Package includes (1) clear glass 16 oz. Primula Double Wall Glass Mug and (1) green Primula Tea Bag Buddy. If you have any questions about this product by Primula, contact us by completing and submitting the form below. If you are looking for a specif part number, please include it with your message.